7-Ethyl-10-Hydroxycampothecin (SN-38) is a derivative from 10-hydroxycamptothecin(10-HCPT),10-HCPT is natural campthecin, a cytotoxic quinoline alkaloid originated from camtotheca acuminata or Nothapodytes pittosporoides(Mappia). This SN-38 is natural from natural camptothecin. 1. 7-Ethyl-10-Hydroxycamptothecin with purity 99% by HPLC,in house standard. 1. Single impurity of 7-ethyl-10-hydroxycamptothecin: less than 0.5% generally, <0.1% as required. 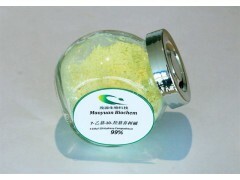 3.13000 square meters production area and more than yield of 50kg 7-Ethyl-10-Hydroxycamptothecin per month. 7-Ethyl-10-Hydroxycamptothecin showed remarkable anticancer activity in preliminary clinical trials by inhibiting the DNA enzyme topoisomerase I (topo I). 1. 7-Ethyl-10-Hydroxycamptothecin is the natural starting material of Irinotecan HCl. 2. This compound 7-Ethyl-10-hydroxycamptothecin is a featured product for Apoptosis research.